This watch is absolutely gorgeous. The quality is excellent. I could not have selected a better quality watch for the reasonable price. I highly recommend this watch. 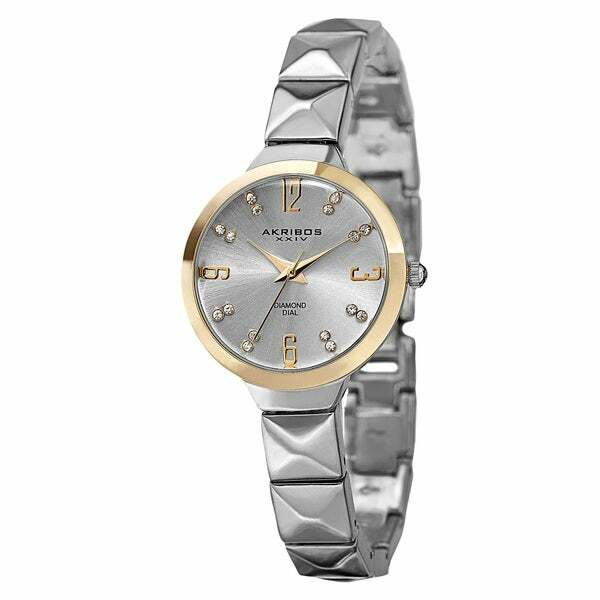 This is a very pretty watch that will go with any kind of outfit from casual to business to evening. Nice size, somewhere between the very large watches you see everywhere now and something that might be considered too small to be fashionable right now. What I like most about this watch is the look of it and the durability. I've had this watch for years now, and it is still chiming away! Top-quality indeed! I bought this watch as a graduation gift for my niece. It is really nice looking and looks much more expensive that what I paid. My niece was thrilled with this lovely watch. classic and elegance without being gaudy. Will be great for someone with large wrists. Was a bit too large for me and I wear size 8. Great watch for a fabulous price, which I can wear in pool and ocean. Watch band is a little aggressive but I am a big girl and can carry it off. Great watch, I wear it to work. Very beautiful watch for extremely good price. design of watch and price. Hello wildbriar, the country of origin is Hong Kong. Thanks for shopping with us!